One of the largest and most popular US friendly sportsbooks, Sportsbook.ag has just recently launched their new DFS, Daily Fantasy Sports, betting platform. They are launching it in Beta form, as they probably have different aspects and kinks to get just right. Some may think they are late to the fantasy betting scene, but they would be wrong. 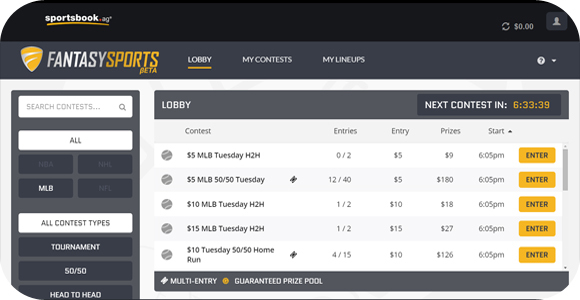 We have the pioneers like DraftKings and FanDuel that are way ahead of the competition, but they do not have what this site does, an already proven method of wagering. Sportsbook.ag already has a huge member base that can compete against others, and they already have a game plan of how to make it profitable, unlike the competition. Many other online sportsbooks view fantasy sports as a loss leader, with its only purpose to bring in customers, but they also see the potential it has with expansive marketing. The reason this is such an appetizing concept is that Fantasy Sports betting is legal in the United States.